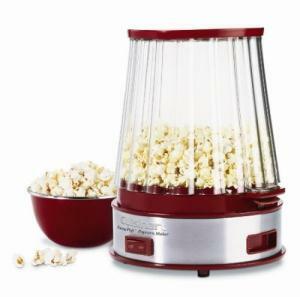 The Cuisinart EasyPop is a unique looking machine because of its scalloped shaped bowl, which is formed in the shape of an old fashioned popcorn bucket. What I think is cute is that the corn pops inside, then you can flip the bucket over (there's a plate that keeps the corn inside) and serve from it. I love that it saves a dish and is such a fun, inventive idea. This machine operates using a motorized stirring system, making popcorn like you get at the theater. The bowl vents moisture to keep the popped corn crisp. The bowl, cover, stirring stick, and popping plate are dishwasher safe. The whole process takes less than five minutes and produces a tastier, healthier version of the snack than you can make in the microwave. The mechanism pops with less waste. You choose the amount and type of oil and salt. A number of sweet and spicy mix-ins are possible once the corn is ready. There is a great debate over this particular popper. The people who love it claim it makes the best corn they've ever had, and are thrilled with the function. Those who dislike it simply hate it and claim it is an incredibly delicate, easily broken nightmare or insist that the corn it creates is soggy at best. I trust Cuisinart, but with almost two to one against this item, I'd make sure to keep my warranty information at the ready.